Howell’s Dive Shop offers the full range of PADI dive instruction, including most of the PADI specialty courses. Howells will teach classes around your schedule needs. Call us to determine what schedule will work for you. This is the beginning level, learn-to-dive, certification class. If you want to begin exploring Earth’s surface which lies under the oceans, this is where to begin! We keep our classes small 2-4 unless you have a group then we can go up to 8. The Advanced Open Water program is the next step of training beyond the Open Water course is open to anyone who is a certified diver. This is a great way to improve your skills and meet local divers. You will participate in 5 Adventure Dives over the course of one weekend. The AOW course will help you advance your diving skills and introduce you to new types of diving which you may have been eager to try with some guidance from an instructor. Are you prepared to respond to an out-of-water emergency involving sudden cardiac arrest, stroke, shock, or severe injury? This course offers you training in the latest CPR techniques and then proceeds to prepare you for providing life-saving first aid. Divers and non-divers alike will benefit from this course. There are no prerequisites. Dive Master Certification is available. This is the first level of professionalism that leads up to becoming a Dive Instructor. As us about becoming a Dive Master. For information Click Here! Once you have mastered the basics of diving and begin to experience concern for the welfare of the other divers around you, this course is for you. The course begins with self-rescue techniques and then progresses to steps you can take to respond to an in-water emergency. Using role playing techniques, students organize and execute rescue efforts for diver emergencies. 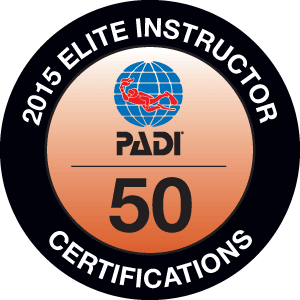 PADI Specialty Courses are a great way to increase your skills and confidence while mastering a new aspect of diving. 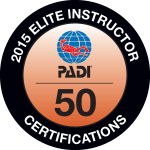 Become certified in 5 specialty areas, and you are on the way to a Master Scuba Diver Certification, the “Black Belt” of recreational diving.